A visual from BJP office in Panaji where the mortal remains of Goa chief minister Manohar Parrikar being brought. 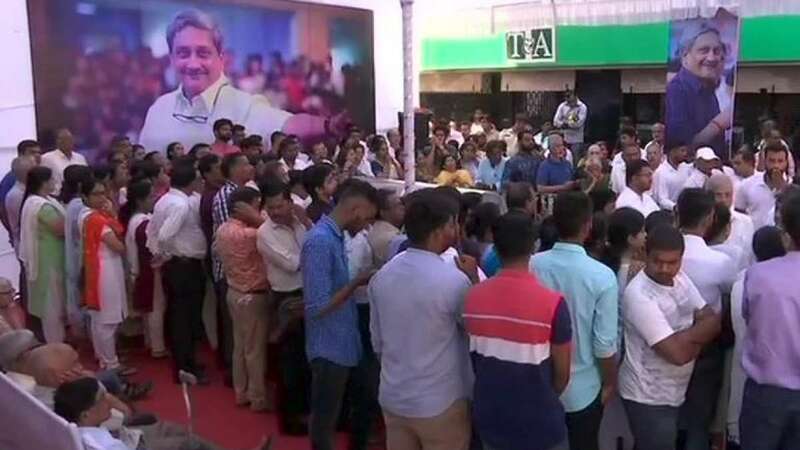 Goa : Goa Chief Minister's Manohar Parrikar passed away on Sunday evening after a prolonged battle with pancreatic cancer. According to live update, his body has been taken from Panaji to BJP head office and after 10:30 am his mortal remains will be shifted to Kala Academy in the capital city for public homage. People can pay their final tribute to the CM till 4 pm after which the funeral procession to Miramar area in Panaji will be held. Home Minister Rajnath Singh will be present for the funeral. Manohar Parrikar was the four-time chief minister of Goa and former defence minister of India. He was a great politician who acted as a bridge between RSS and the Church. From working as an RSS karsevak in Ayodhya during the demolition of the Babri Masjid in December '92 to establishing his party's writ in Goa with the help of local Catholics, Manohar Parrikar could boldly balance his ideology with real politics like no one else. Following the heart-breaking demise of Chief Minister and former Union Defence Minister Manohar Parrikar, High Court of Bombay at Goa and District Courts in the state shall remain closed on Monday to observe a day of mourning. The state also announced 7-day mourning after the death of chief minister. All schools and educational institutions in the state will be shut today and all examinations have been postponed.